1. The Situation: What were The Scottsboro Boys known for? Who were they? What did they do? How did they get in so much trouble? 2. 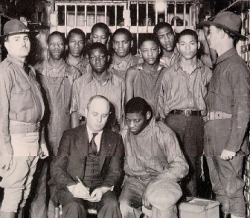 Lack of Help: The Scottsboro Boys’ attorneys were extremely incompetent. How did the defense attorneys show their lack of experience? 3. Outcome: Were The Scottsboro Boys ever pardoned of their wrongful convictions? 4. Lesson Learned: What is the lesson we can learn from this event? 5. Social Signifigance: Find a quotation that symbolizes the impact of this event. 6. Connection: Make a connection to our society today.